The AFLS is designed to provide a criterion-referenced, cost-effective system that will quickly empower you and your staff in engaging their clients in functional skill acquisition, while providing your district or agency the ability to track and monitor progress effectively. Professionals who have utilized this assessment system, in conjunction with their treatment plans, have seen an immediate impact and are able to maximize therapy time with their learners. 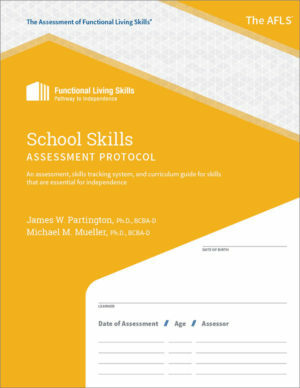 The AFLS has a unique scaffolding approach to skill presentation. It’s simple, affordable, and dynamic in teaching your clients the skills they need for independence across all functional living environments. By purchasing your AFLS system today you’re providing your staff with the ability to document positive results immediately while providing your clients the skills necessary for functional living. "The AFLS has been a huge asset to the assessment and intake process for our clients. When they are beyond the ABLLS and require programming that focuses on functional living skills such as chores, compliance, following routines, and participating in social scenarios, the AFLS is our go to. The programming and grid system allow parents and teachers to see the individual’s current skill level and progress and allows us as clinicians to choose the next targets with ease. The AFLS protocol supports our clients as they continue to work towards participating in their daily life at school and in their homes."